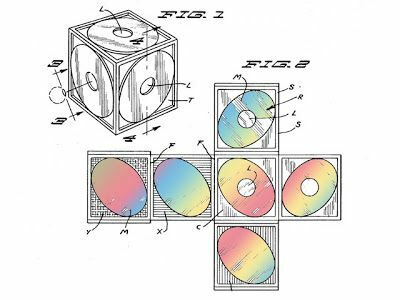 Patents, love them or hate them, are all about providing encouragement for innovation. We hear about patents everyday in our lives from the media through never ending old patent infringement claims to advertising extolling the benefits of "our patented product X". 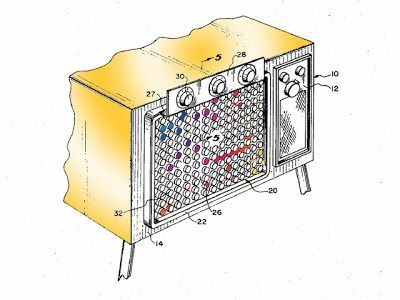 As dull as all that may be don't despair because here I present to you some truly cool and weirdly psychedelic patents from the past and present that will cheer you up. From the mind of prolific inventor Donald Booty comes this idea for a turntable with built in light performance apparatus that flashes lights from beneath the turntable through a series of rotating discs. Issued in 1987 I suspect Donald may have been about about 10 years too late with this one as it has 70s kitsch written all over it. With CDs just around the corner, this psychedelic light show was never really going to make it to production I suspect. Here is a cool little idea for a psychedelic themed clock. As stated in the patent's description "... the face is comprised of a plurality of geometrical configured spangles ... comprising small metallic plates that are burnished or chased so to in part break up light rays into their spectrum colors ... producing a shining effect of psychedelic interest" . Even if it doesn't tell the time correctly I want one now ! Another product of the early 70s was this psychedelic lighting machine which claims to produce a psychedelic light show that appears to "hang in space" beyond the original light source. Is this guy talking about 3D holographic projections like the Star Wars chess set ? Sadly no, this one is a little more like, well, I'm not entirely sure but it looks cool in the drawings anyway ! In 1970 inventor Paul Turnrose came up with this idea for a psychedelic TV cover which when placed over the front of a regular TV set, colored lights from the the TV tube are transmitted through a series of colored molded plastic filters to create a homegrown stoner light show in the comfort of your living room. So 70s it would probably be worth a fortune to collectors now if it was ever produced. Glowsticks, those horrible sad artifacts of the 1990s rave scene are still occasionally seen waving about in a kind of prolonged ravey death. Long before ecstasy gave rise to fluffy ravers inventor Robert Lochrage saw a need for glowsticks in 1969 ! This glowstick granddaddy didn't stop at just one or two glowsticks however. His invention called for the use of four "flexible elongated members" ( oooo errr ! ) connected to a handle. These "light pipes" would then flex about producing random psychedelic glowing patterns in the air much like a modern glowstick does in the hands of a gurning nuff-nuff. Yep you read that right. 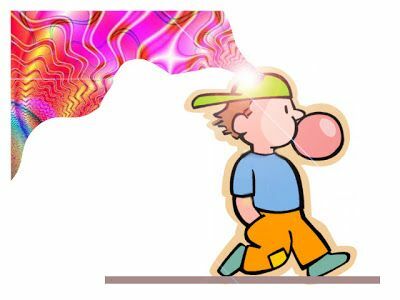 This is an idea for psychedelic mind expansion in the form of a hit from a piece of chewing gum. Surely you don't mean lace some chewing gum with a psychoactive drug and pass it off as psycho-spirtual God fruit ? The patent's applicant Eduardo Jose Gonzales makes a good case for the need for such a "dietary supplement" which you can read about in detail in the link below the image. Good luck getting this past the FDA George. 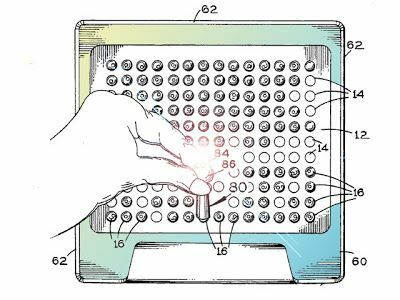 From the world of gaming comes a rather surprising patent that goes to show how it's possible to patent just about anything you want. Nintendo America have an existing patent application which defines an in game character's sanity level based on the character's interaction within the game. I never would have thought this to be something people could patent. Sony also has a similar patent for a character's emotions when interacting with other characters. I wonder how this effects other companies game development life cycles ? It is interesting to think about where this is headed in the future. As software becomes more and more embedded in the life of humans who will own our future sanity and emotions ? At first glance you might think this invention has to be right out of the 70s but oh no, in 1998 John Maxim though that teenagers would much rather psychically play with rotating light pegs than spend time on Half Life, Unreal, Pokemon, Baldur's Gate or that new Google thing. Still, it does have an endearing childlike psychedelic feel about it. I'm pretty sure I actually had something like this back in the 70s actually. I wonder what happened to it ? I probably turfed it as soon as I discovered the PacMan machine at my local fish n chip shop. Check out the very first line of the introduction to this patent - "The present invention is the method and apparatus for providing sound or visual cues to provide the synchronization in time of groups of individuals in meditation, contemplation, prayer and physical movement". Sounds pretty Orwellian huh. But wait, it gets better ... "The user of said devices experiences a sound or visual cue at one or several given times a day. On the cue the patient consciously takes some moments to engage in said activities. As a group of individuals are using the same moment to engage in the same or similar activities the user may feel a sense of belonging to the group". Ummm.... WTF ! This one is a kind of 3D kaleidoscope with a twist. In theory it produces a never-ending series of reflected oval and square tunnels that appear to have infinite depth. This uses the basic "point a mirror at a mirror" idea that we have all tried at some point in our lives. This would be a cool little trippy toy to play with when "in the mood" and it's compact size would make it great for taking along with you to festivals and parties. You know how when you go camping and you just wish that your sleeping bag could double up as a self contained meditation tent. Well, wish no longer ! This is one were a picture definitely speaks more than a thousand words, especially if the words are Aum. Check it out at the following link. Some time back I wrote a post about how to hallucinate without the use of drugs. One such method was through the use of lighting that stimulates the brain. 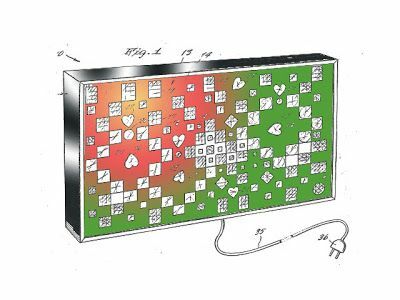 This is essentially the theory behind this invention by Mitchell Altman ( the hacktivist behind the fun TV-B-Gone device ). The machine has a series of lights mounted to glasses and a pair of inbuilt speakers. The lights flash at a frequency that can induce a hallucinatory state or "elevated consciousness". There are a bunch of such devices around these days but this one has some excellent schematics so check em out - I think the one below would make for an excellent tshirt ! Maybe I should patent that ! This one is a classic. 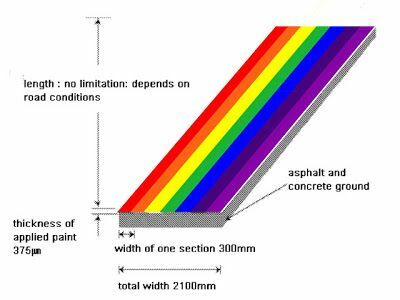 Korean ideas man Keum Kyu Kim is calling for the installment of an environmentally friendly world-standard rainbow colored highway in all continents of the planet earth ( plus Korea ) so that it may slow down global warming and aid in the global peace process. The idea is that people will take to ditching their gas-guzzling motorized systems of transport in favor of a leisurely bicycle ride on the new psychedelic super highway. You have to applaud the vision. Now this i like. Here we have what is essential two crystals dangling from a hat. Or in the words of inventor Napoleon Epps, a mediation enhancing device that can conduct electromagnetic and other energy directly into the brain. Hmmm, I'm thinking of replacing those crystals with vegetarian cocktail sausages which would probably be more effective in the long run ( and it would save on production cost ! ). And just what is "other" energy anyway ? Okay now I'm think someone in Korea is just having a laugh at the patent officers' expense. 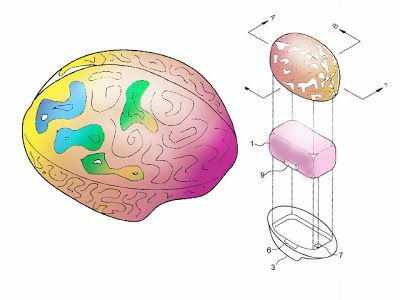 After the wondrous rainbow highway we have some more oddballs from Korea who wants to patent a miniature, portable vibrating brain to be used for "relaxation and meditation" and "improved blood circulation". Almost as trippy as the invention itself is the name of the company behind it - "The Korean Research Institute For New Human Science" which is actually located in America and has since been renamed the less eugenics sounding Korean Brain Science Institute. It is headed by a kind of cult leader, Ilchi (Seung Heun) Lee , who has been under a lot of fire recently for claims of medical fraud, shady business dealings and a other dodgy practices. Continuing with the oddball leader theme we have author on shamanism and doctor of anthropology Michael Harner who came up with a device he claims can induce altered states of consciousness by means of little more than spinning around while lying down flat. A kind of "human centrifuge" if you will. Harner and his group "Foundation for Shamanic Studies" are well known to debunkers who warn people to steer clear of his pseudo-science shamanic teachings and this invention kind of confirms it for me. I suspect all this machine will alter is the relative location of your stomach's contents to the nearest available bathroom. 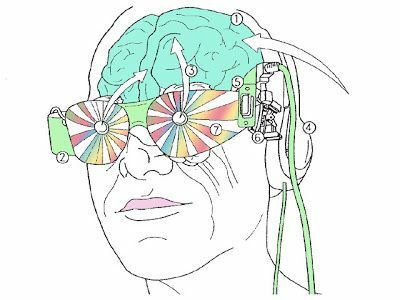 We there you have it guys - a nice look through the warped minds of a number of psychedelic inventors and forward thinking kooks. Which invention would you like to own ? Personally I would love to get my hands on the 3d kaleidoscope thingy as I think that would be a nice little toy to have around the home. The psychedelic rainbow highway would also be cool to see. It would by like riding your bicycle in a cartoon landscape ... might get a bit vomit inducing after a while though. Okay, that a bit too much information ... time to go.